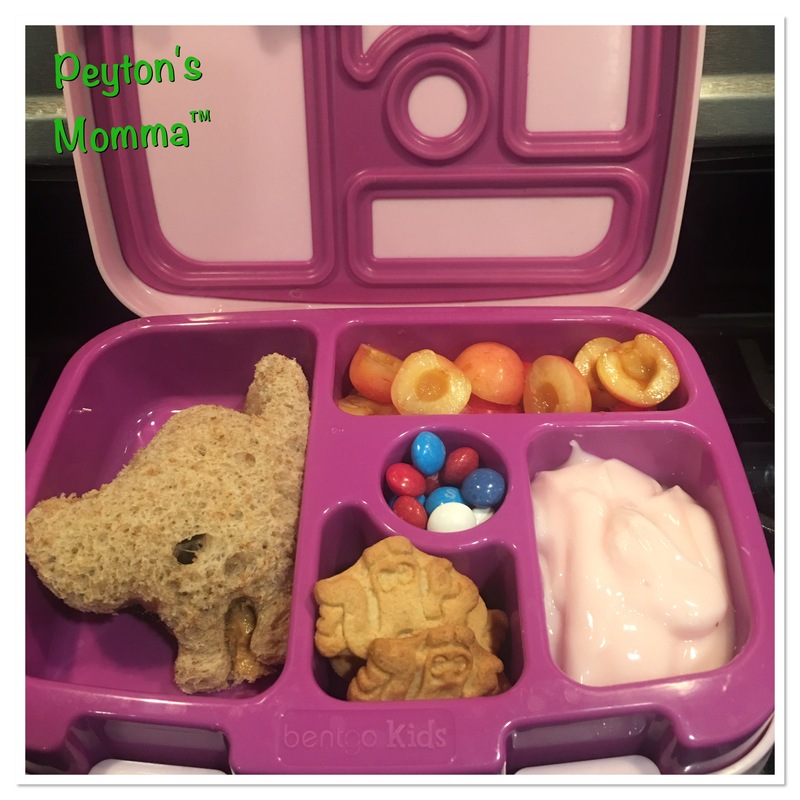 I’ve been making Peyton’s lunches for a few months now and I must admit I’m still having a blast doing it! Even though she has been requesting lots of peanut butter and jelly sandwiches I keep her box fresh and fun with new and interesting sandwiches thanks to my extensive collection of cookies cutters! I haven’t used our Halloween cookie cutters since last Halloween. But I came across them while I was cleaning up our baking area. How fun is a sandwich in the shape of a cat? My one complaint about end of summer is how fast the fruit spoils. No matter how quickly I take it home from the store and toss it in the fridge it’s bad within a few days. So today Peyton is finishing off the last of our cherries. These were so tart and tasty. Reiner cherries are definitely worth the increased price for them. And you know what goes really well with fresh cherries?? Cherry yogurt! I taught Peyton how to dip her fruit in yogurt and she loves it! Now I just have to be sure to give her fruit and yogurt that go together. I also threw in a handful of Finding Dory graham crackers. There’s Hank making an appearance. The only septapus I know. And I threw in a few red, white and blue skittles. Have to show our team USA support! Making lunch for Peyton takes me about 15 minutes every morning from start to finish. But I love it! I know she is eating healthy food and not some empty calories junk the federal government feels is the best nutrition for my child. I’m sorry, but I feel the federal guidelines for lunches is a bunch of crap. With school starting in a few weeks, I urge you to take the time and really look into what your child is being served at school. If you decide to take the plunge and make your child’s lunches I have a slew of the lunches I’ve made her all summer. And each one has links to the tools I used to create the lunch!